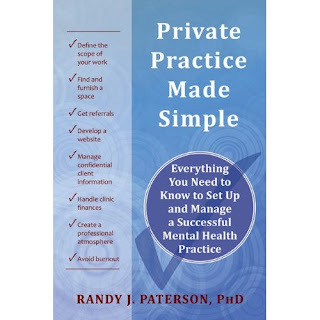 The Friday series based on my book Private Practice Made Simple (available from Amazon USA here, and from Amazon Canada here) continues, and finally we’ve arrived at financial issues. When I conduct workshops on this subject I usually start with a brainstorming session about the attractions and repulsions of private practice. People list a lot of attractions, but as the list lengthens we can all feel an elephant growing in the centre of the room. Of course. Businesses make money. Most clinicians are not independently wealthy, and they have families, homes, a mortgage, and other expenses. They cannot afford to run the practice for nothing or at a loss. Presumably they didn’t go into the therapy field in order to become millionaires – or if they did, they were harshly misguided. But yes, they want to earn a good income with their practice. And just look at that hourly rate. In my home province of British Columbia, the recommended rate for private practice psychologists is $175 per hour. Compare that to the hourly rate for psychologists in instititutional settings, where it runs between $40 and $55 per hour. My gosh, by opening a private practice you might be quadrupling your salary! A lovely fantasy. But this is like saying “Buying a house would cost me $600,000 but the rent for one is just $1800.” The numbers are not comparable because they refer to completely different things. First, let’s consider when you might actually receive your hourly rate in institutional and private practice settings. When I worked for the hospital, I was paid for 7.5 hours a day, regardless of what I did. I would be paid for seeing clients, just like in private practice. But I was also paid for sitting in committee meetings, consulting with the department secretary, preparing for sessions, writing notes, conducting research, designing information sheets, calling referral sources, and even wandering the hallway. To be sure, like most professionals I put in a lot of unpaid overtime. But I would be paid for 7.5 hours, even if I didn’t see a single client that day. In private practice you do many of the same things, but you only get paid for the time you actually spend with clients (and, occasionally, writing a note on the client’s behalf to an insurer or lawyer). You still have to consult with colleagues, keep up to date on the research, design forms, write notes, prepare for sessions, call referral sources, and so on, but you don’t get paid anything for doing these things. Plus, there are many more things to do: interact with your landlord, arrange and troubleshoot computer and phone systems, manage the finances, plan the promotion of your clinic, and so on. All of these take time, and none of them pays a nickel. So in private practice you actually get paid for many fewer activities than you would in a salaried position. In an institutional setting, your pay is your pay. Some of it goes to income tax, some goes into your pension plan or other benefits, and most of it goes into your pocket. In private practice, your pocket is the last place it goes. Before you pay yourself you must pay every expense the clinic incurs: the assistant’s pay, the lease, the furnishings, the phone, the computers, the test materials, the photocopying, the accountant, the stationery, the pamphlets, the ads, the insurance, the business license, and more. Once all of these are paid, you (and the income tax department) get the leftovers. If any. Furthermore, most of your expenses are fixed: they are the same, regardless of the number of clients you see. If no one comes one week, you still have the same list of bills, but you have much less revenue with which to pay them. When I was budgeting for my program at a hospital, I couldn’t just write down the salary a new staff member would be paid. I had to add 17% to reflect the value of the additional benefits the person would receive: pension plan, extended health, short- and long-term disability insurance, and so on. Plus, the employee would be entitled to 10 statutory holidays per year plus several weeks of holidays – all of which would be paid the same amount as a regular workday. In private practice all of these benefits disappear. You can buy extended health and disability insurance if you want it, but that will come out of your take-home pay. And although you will likely take most statutory holidays and some vacation time as well, you will get paid nothing for them. So the rates of pay for institutional work and private practice cannot be compared directly. 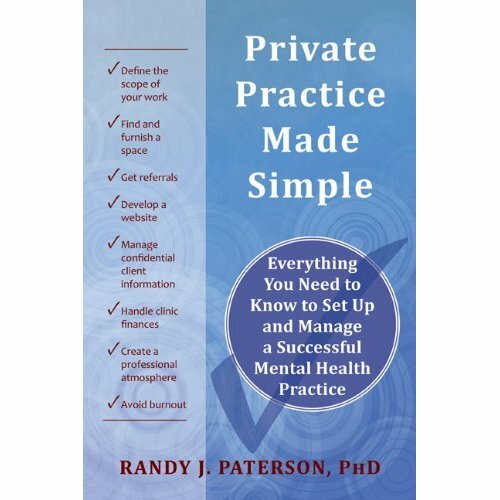 In private practice you are paid for far fewer activities than in a salaried position, and that pay goes to many more things than in an institutional setting. Plus the invisible 17% over and above your salary vanishes. The result is that some months, private practitioners may have no take-home pay whatsoever. Rather than being a “license to print money,” a private practice has to be carefully managed in order to preserve a fair proportion of the revenue for take home pay. This can be done, but not without careful planning and a stingy nature. Next week: I’ll introduce perhaps the least appealing of the forms that accompany Private Practice Made Simple: The Private Practice Income Calculation form. Completing it may take two of the dullest hours of your life – but if you do, you will be ahead of the vast majority of private practitioners. You’ll have a sober assessment of the amount of money you need to make and the expenses your clinic will incur.